This episode begins as recounted by an electronic diary written by Jeremy. 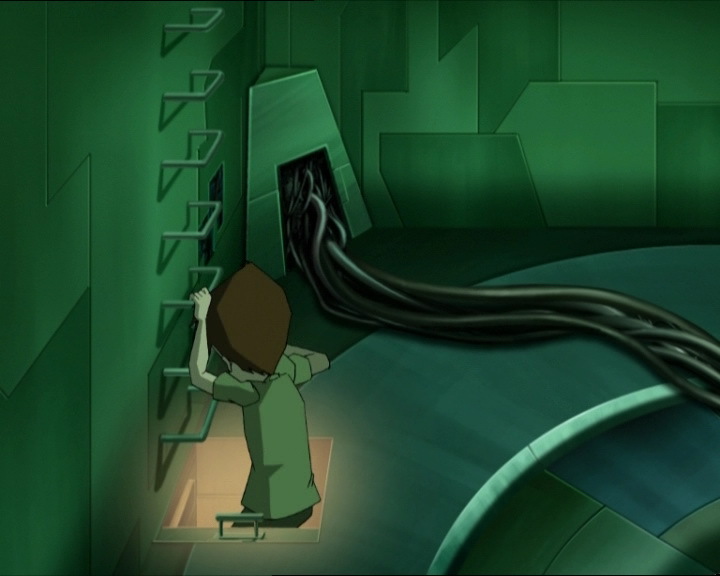 During the narration, we see Jeremy sneaking to the factory during the night, into the Supercomputer room. While the journal speaks with Jeremy’s voice, it explains that one day Jeremy went to the factory to find scrap material to finish one of his miniature robots. He had then discovered the inactive scanners, Supercomputer and control terminal. Standing before the handle, Jeremy flips the switch, hoping that he won’t regret it one day. In a large blast of light and wind the machine starts up again, ruffling Jeremy’s hair. Odd never ceases to bury the boy in his laughable jokes and isn’t discouraged when Ulrich asks him to leave him alone. We find Jeremy at the factory. 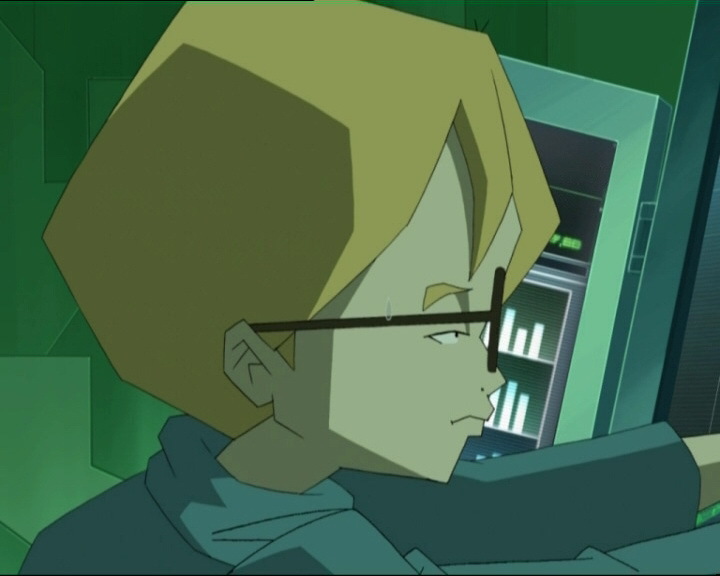 He’s in contact with the AI which he has named “Maya.” Not knowing what she’s doing there, Jeremy tells her that from what he’s understood, she’s in a virtual world called Lyoko. He asks her if there’s a way to leave the Tower and Aelita does so, surprised as she passes right through the wall of the tower. The holomap then activates, showing an entire virtual world and leaving Jeremy flabbergasted. He reveals to Aelita that she’s in a world not limited to just the Forest. He says that he can spot four Sectors…the young pink-haired girl runs into Kankrelats which then attack her, forcing her to hide in the Tower. Cornered, Jeremy decides to take Ulrich to the factory. He reveals everything to him: how he met Maya who had no memory and how an evil entity was making an attempt on his life by hacking electronics, and on Maya’s through the use of monsters; he tells him about the scanners that can be used to travel between the two worlds…not convinced, Ulrich decides to use Kiwi as a guinea pig. He manages to grab Kiwi but wakes Odd up at the same time. Ulrich then heads back to the factory with his roommate and Sissi right behind him! Ulrich places Kiwi in a scanner but Odd accidentally takes his place. He is trapped inside as Sissi looks on in in terror and finds himself landing in the Forest. Ulrich joins the enthusiastic boy immediately. Both discover their virtual appearance and weapons. - Attack: Take control of electronics to give some juice to those who know about the existence of the Supercomputer. - It was Jeremie who discovered the factory and Aelita (who he at first named Maya). He turned the Supercomputer back on himself. Aelita hadn’t the slightest recollection and discovered her world at the same time Jeremie did, before being attacked by Kankrelats and taking refuge in a Tower. Jeremie then confided the secret to Ulrich when he discovered that the hero was the deliberate target of attacks. Following the notebook (doubtlessly Hopper’s), Jeremie found out everything he could about the virtual world, virtualisation, etc. Ulrich and Odd fortuitously met because Odd, a newcomer, was placed in the same room as Ulrich. Ulrich took Kiwi to be a guinea pig in virtualisation, but in doing so led Odd and Sissi to the factory. Odd was accidentally virtualised and followed shortly after by Ulrich. They discovered their new looks with enthusiasm and compared the whole thing to a video game. The secret therefore was first kept between Jeremie, Ulrich, Odd and Sissi…all promising not to tell it to anyone else. - Only episode summarised with a voiceover. - Jim was a forest ranger in Quebec and master of the Raging Hand of Lei Fu Chang! - Jeremy falls immediately for Aelita’s charm, as soon as she appears on the screen. - Before meeting and becoming friends, the heroes referred to one another by last name. - Odd’s bed sheet changes when he presents his dog to Ulrich. 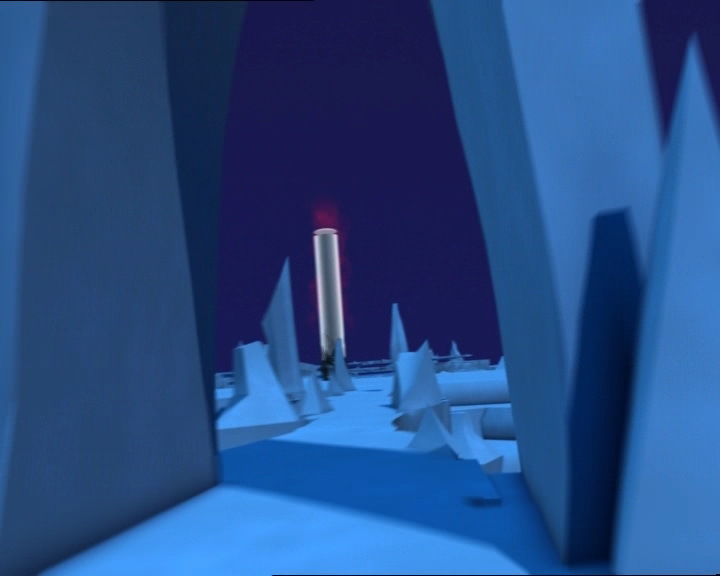 - Just as Ulrich is devirtualised, the Way Tower has a red glow. - The door to Jeremie’s room is brown instead of grey just before Ulrich enters. 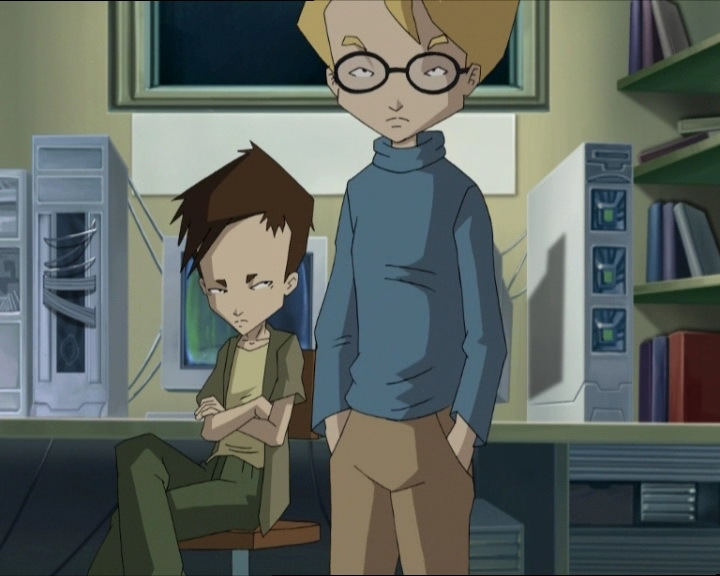 - Odd’s pants are entirely the darker colour at the moment when Jeremie is getting ready to speak to Aelita. 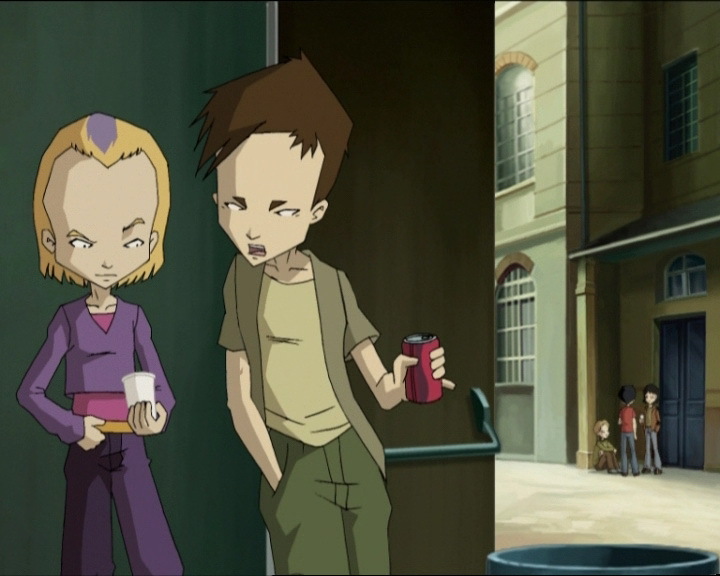 - In certain scenes, Jeremie can communicate with Aelita, Odd and Ulrich without a microphone. - The marks under Nicolas’ eyes disappear while he walks behind Sissi who is talking to Ulrich. - The yellow button used to call the lift is absent before Jeremie presses the red button to go to the lab. - Jeremie says he is a year 8 student, but the prequel takes place one year before season 1, so he should have said that he was a year 7 student. - At the moment Aelita says hello to Jeremie, she’s modelled like in season 1 (small eyes and earring at the point of her ear). - When Jeremie is typing on his computer, a pen can be seen lying on the cable of his keyboard, and when he notices the eye of XANA on one of his robots, the pen disappears. - In episode 49, “Franz Hopper,” Jeremie says that they turned the Supercomputer back on together, but i this episode we see that it was Jeremie who turned it on by himself. - This episode was aired later in season 3 but the events take place before the season; their very first fight against XANA. This “prequel” episode was conceptualised very early, around the end of season 1. It was originally planned to be shown during season 2. - First episode to finish on a shot of an activated Tower. - Kiwi was almost virtualised, and in episode 80 “Dog Day Afternoon” he will be. In episode 44 “Vertigo,” this is confirmed. - Odd uses his shield, which he normally seemed to acquire in season 2 (or maybe he spent a season not using it). 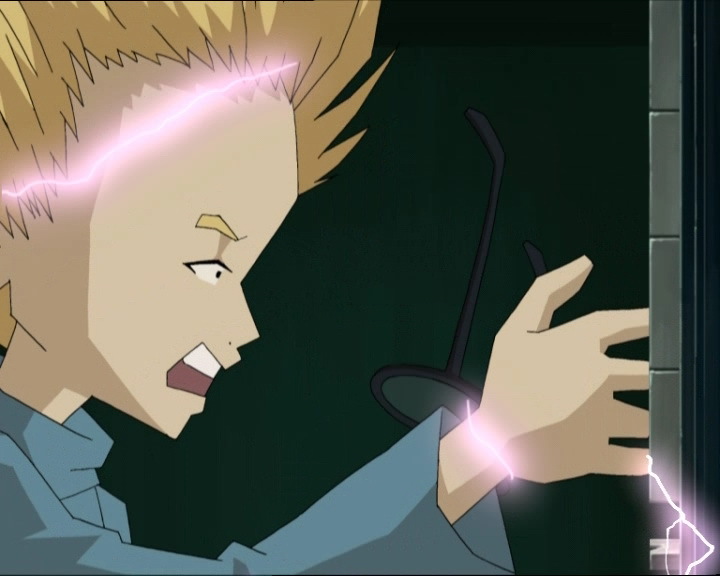 - We can notice in this episode elements that refer to the original project of Code Lyoko: Garage Kids! When Yumi tackles Ulrich to the ground, their both blushing appears in both cases. -The name Jeremy gives to Aelita during one of their first conversations can be seen as an affectionate pseudonym, because in a combination of English and French it can be written “My IA” (My Artificial Intelligence). Voodoo is a religion with many rituals, including animal sacrifice. Sarcophagi are types of coffin in which the Egyptians of Ancient Egypt mummified their dead, and sometimes even their pets! The sarcophagi of pharaohs were sumptuous and hidden in tombs with secret traps. Putting the dead in sarcophagi preserve the body intact for thousands of years! Jeremy’s diary: Diary of Jeremy Belpois, Kadic Academy eighth grade student, October 9th. A few weeks ago I was hunting for parts to finish building my miniature robots. I couldn’t find anything around here I could use, so I decided to rummage for scrap in the abandoned factory not far from the academy. I figured that I could find plenty of cool old mechanical stuff left inside there that would be useful. And I wasn’t disappointed, it was unbelievable! I stumbled into some sort of complex, with an entire computer lab with scanners, and especially this totally intense mainframe. For the moment, I haven’t told anyone, it’s my little secret. It’s the coolest thing that’s ever happened to me. And that wasn’t all; that night, even though I was scared stiff, I decided to start up the computer. Jeremy: I hope I’m not going to regret this in a minute…ok…go! Jeremy: Wow! What’s all this? A video game? 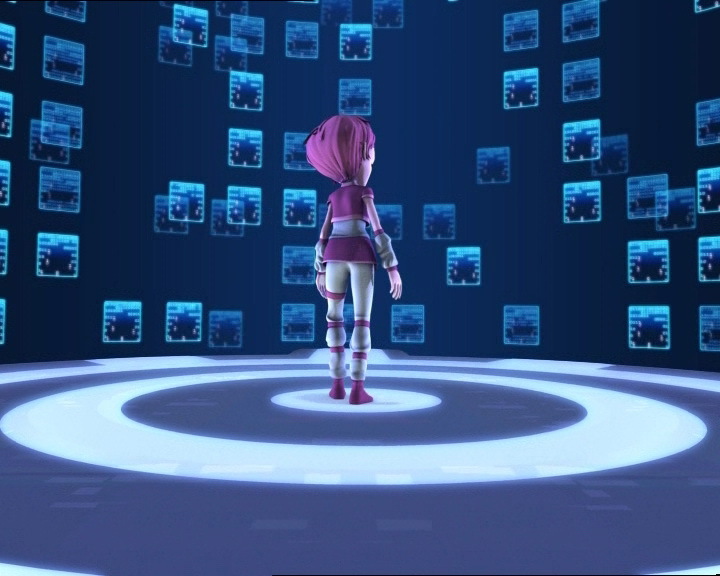 Aelita: Uh…who-who are you? Where…where am I? Odd: Uh…are you Ulrich Stern? Ulrich: That depends. Who wants to know? 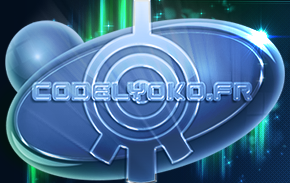 Odd: Odd Della Robbia! His brand-new roommate! Odd: I’m new at the academy and the principal told me to move in with you! Ulrich: Uh…latch onto me sounds more like it. Odd: Relax! I’m totally cool! Trust me, you’ll see; you won’t even know I’m there. Sissi: I’ve got something very important to tell you. Ulrich: Important like, uhh I’ve lost my mascara, or my pink t-shirt ran? Sissi: No, nothing as serious as that! Odd: Ulrich…sweetheart? Who’s the good-looking babe? Ulrich: Sissi, that principal’s daughter. Guys flip over her but she’s only flipped over me! Ulrich: Cool? She’s totally brain-dead and a leech as well. Odd: In that case, it’s pretty lame. Odd: And the waiter says, I don’t have frog’s legs, that’s just the way I walk! Ulrich: No. But what I am beginning to get is that you’re determined not to give me a break! Odd: We’re going to have to get to know each other. And you’ll see, by the end of the day, you won’t be able to do without me! Jeremy: Artificial Intelligence, can you hear me? Aelita: Yes, but…would you mind calling me something else, please? Jeremy: Ok…how do you like the name…Maya? 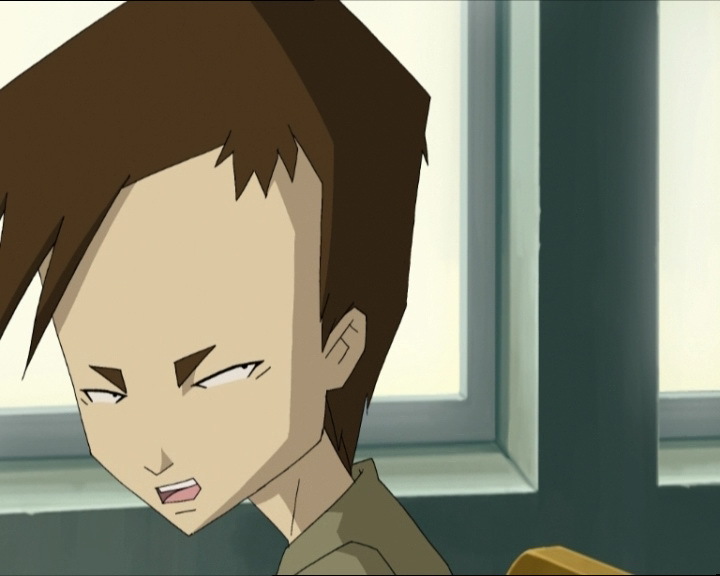 Aelita: Uh, Jeremy? I’m not all alone out here…there are some animals. Jeremy: That’s fantastic! This virtual world has an entire ecosystem with virtual living creatures! Can you get closer? 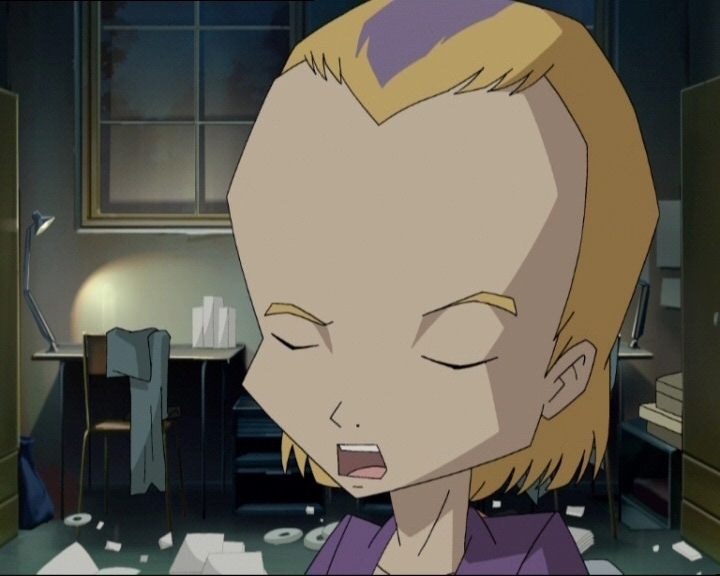 Aelita: Jeremy! They’re attacking me! Jeremy: Run away, Maya! Get back to the Tower! Ulrich: Plus, no offence, but you’re not her type. Odd: Oh yeah, I hear that a lot. Ulrich: You wanted some juice, well you got some! Jeremy: Very funny, Stern…but, thank you all the same! Jim: How are you all? I’m happy to see so many of you here tonight! Jim: Canari Paya! Kogusoku! Jutsu! No, these are not dishes from the Golden Dragon Chinese restaurant. Hahaha! Eh? Ah…no offence, Miss Ishiyama. Yumi: None taken, Sir. I’m Japanese. Jim: As they did for me when I was a forest ranger in Quebec! Jim: That night, well, I was quietly enjoying a waffle with maple syrup by my campfire when I was attacked by a vicious beaver! Its razor-sharp teeth were going for my jugger, but I was able to save myself thanks to my perfect mastery of the Raging Hand of Lei Fu Chang! Jim: What? What’s so funny about that? Ulrich: Honestly, I think you would’ve been better off not talking about it! Ulrich: Huh?! What is with this mess?! Where did that mutt come from?! Odd: Uh…that’s Kiwi, my dog. He just had a little fit, that’s all. You’ll understand. The poor thing’s not used to being cooped up. Ulrich: I mean look at this! My CDs, my clothes, he’s trashed everything! And he-argh! Did you see what he did in my bed?! Odd: That’s ok, Kiwi! My little diggety-dog! Ulrich: Come on, tell me! Maybe I can be of some help! What if you suddenly get attacked by a hairdryer and I’m not around? Jeremy: First, tell me if you can keep a secret. Jeremy: What’s the matter? Scared of heights? Ulrich: You know what, Belpois? This morning’s electric shock fried your brain. Jeremy: Oh yeah? And what would you call this, huh? A program for spray-painting doors? Ulrich: Who’s the girl with the pink hair?! Jeremy: Ok. 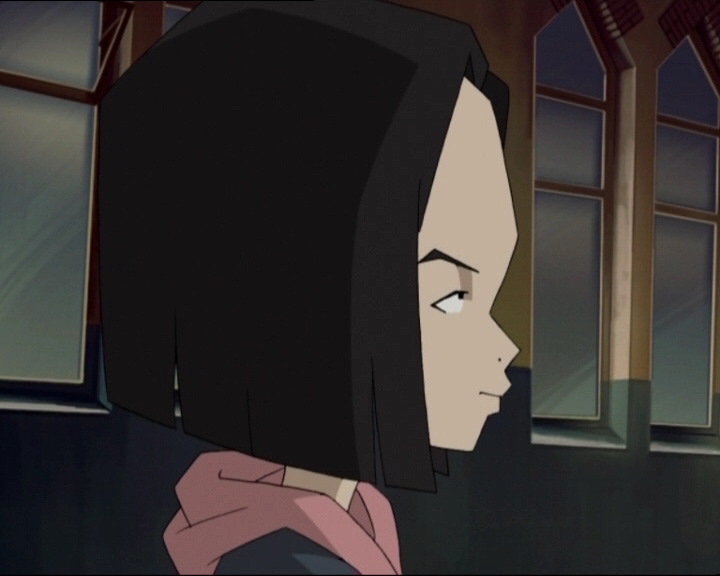 But first I want to help Maya to understand what she’s doing on Lyoko. 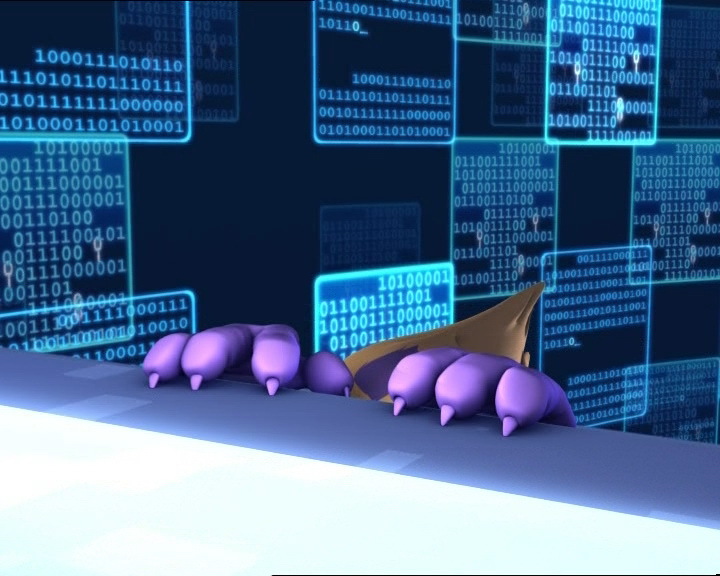 Jeremy: In fact, the Supercomputer analyses your molecular structure through these cabins, and then breaks down your atoms before digitalising them, and re-creating a digital incarnation in the virtual world! Jeremy: You go inside the cabin, you’re teleported to the virtual world. Ulrich: Well, I’ve got a surprise for you, doggie. You’re going to be virtualised! Sissi: I’m sure there’s another girl behind all this! Odd: No look, it’s not a girl. It’s Kiwi, my dog! Odd: But why is he taking Kiwi to this factory? Sissi: Who knows? Maybe he wants to use him for some sort of horrible science experiment! Odd: You watch too many horror movies! Sissi: Yeah, you’re right, that was pretty dumb. It’s probably more like some sort of ritual sacrifice or voodoo thing! Sissi: You’re right! Maybe it’s the tomb of an Egyptian pharaoh, huh? Sissi: Oh no! You’re going to be mummified! Jeremy: Huh? Ah…wait…that’s a weird-looking dog! Ulrich: That’s no dog, that’s Odd Della Robbia! Odd: Huh? And why am I dressed up like a giant purple cat?! Odd: Am I…in a video game? It looks like the set for Babylon Ninja Fighters III! Odd: Uh, there are these giant cockroaches attacking me, is that normal? Odd: Oh, nothing to worry about then! Sissi: What? Send us where, Ulrich? Ulrich: To a virtual world where weird monsters want to massacre you. You wanted to go out with me, now’s your chance! Sissi: No thanks, uh…I prefer real worlds, I’m not into the other kind. Plus I couldn’t possibly miss cheerleading practice tomorrow morning! Odd: Hey that’s not fair! How come he gets to be a samurai? That’s so much cooler! Odd: I don’t dream about giant purple cats! What’s more, I’d rather have a weapon like Ulrich, not these great big useless paws! Odd: Hm…these arrows are pretty cool. I take back what I said! 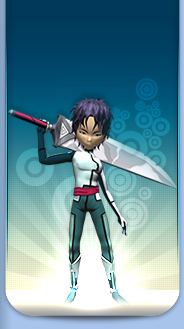 Ulrich: A virtual girl who lives on Lyoko. Odd: Oh, you mean there are babes here too? Great! Ulrich: Yes, but I get the impression that Belpois’ flipped for her. Odd: For a virtual chick? Is he nuts? Sissi: Sic ‘em I said, sic ‘em you dumb mutt! Odd: Ok, right…where are we? Where did the Forest go? Ulrich: How should I know? Ulrich: So how do you kill these things? Ulrich: Great, at least we’re alive. Odd: Uh, alive? Well, if you say so. I think I’m about to throw up. Odd: It works the second time! I told you that by the end of the day you wouldn’t be able to do without me! Jeremy: Maya? Are you there? Aelita: Yes, is everything ok on your side? Jeremy: Well…we’re a little shaken up, but it could’ve been worse.